The Bosque Center rose out of a history of spiritual nurturing. The newly renovated facility now houses the offices of the Episcopal Diocese of the Rio Grande, a full-functioning conference center, and a residence that can accommodate about 40 persons in comfort. This 7.5 acre facility is the culmination of a dream by Episcopal Bishop Michael L. Vono to provide a spiritual center for the Diocese. The Episcopal Diocese of the Rio Grande inherits a long history of spiritual formation with the purchase of the Spiritual Renewal Center. In 1955, Edwin V. Byrnes, the Archbishop of the Archdiocese Santa Fe, invited the Dominican Sisters of St. Catherine de’Ricci to come to Albuquerque, New Mexico, to run the Catechetical Office for the Archdiocese. That year, two sisters came to Albuquerque to begin their ministry with the intention of opening a retreat house for women. Their search for a retreat house and convent continued at various locations for many years, including a 70-acre tract that is now the location of Santa Maria de la Vid Priory for The Norbertine Community. In 1992, with the help of the Board of Directors, comprised of lay men and women, the Sisters moved and rented facilities from the Servants of the Paraclete on Pajarito Road about two miles from the first retreat house location. The Sisters continued their retreat ministry at the Pajarito site for nearly 12 years until the current site of the Spiritual Renewal Center was purchased, renovated and expanded in 2001. In 2004, the Spiritual Renewal Center, through combined efforts of the Board of Directors and the Sisters, built the existing ‘Retreat House’ with rooms for up to forty retreatants, a large gathering space with a New Mexico-style landscaped grounds, mountain views, and local walks and trails. 2009 was a year of goodbyes as sisters became ill and retired. The Dominican Sisters completed their ministry at the Spiritual Renewal Center in 2009, turning over its operation to the Board of Directors of the non-profit corporation. The Spiritual Renewal Center’s history expressed concern that the Sister’s departure meant that the Spiritual Renewal Center had lost the Dominican ‘Face’, and prayers were raised for new directions. In 2009 and 2010, programs were attempted to provide lay ministerial leadership and retreat opportunities beyond its Roman Catholic origins by opening its doors to all faiths and spiritualities. By the end of 2010, Bishop Michael Vono was made aware that the Center might be available for purchase, and negotiations began between the Center’s board and the Diocese. The purchase was finalized and ownership changed hands on January 30, 2011. In the ensuing years the Bosque Center has been renovated completely. The Diocesan Offices were built, and a Conference Center was established to accommodate up to 100 participants. A full function kitchen and dining room were established to provide full hospitality for conference participants. The residence was renovated and modernized to provide luxury in addition to the spiritual presence of the Bosque environs. The Bosque Center now writes its own new chapter in a history of spirituality in the Rio Grande Valley of Albuquerque. Whether you are hosting an executive Board meeting, a casual weekend retreat for a small group, or a high-powered business seminar for 100 people, our conference and retreat center offers the perfect setting. State-of-the art audio-visual equipment ensures that your presentations will be superb. Sunlight bathes every meeting space, while the full-length windows offer unhampered views of the Bosque. As the finishing touch to your perfect gathering, our Bosque Center Chefs will delight your guests with their unique culinary creations served in our finely appointed dining room. 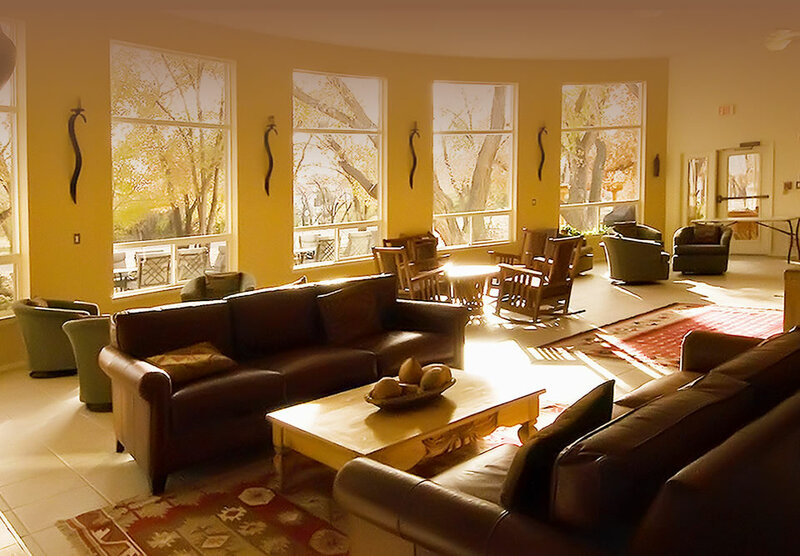 Your meeting, retreat, or conference at the Bosque Center will be a memorable experience.